US businesses on Facebook have a higher propensity to export. The share of US businesses on Facebook that export is 6.75 percent, compared to 4.33 percent for US firms in the general population. We find that the propensity to export is higher on Facebook in every firm size category (except the largest firms) and every industry category, and it is higher regardless of the gender of the business owner. Research consistently shows exporting firms outperform nonexporting firms, yet few small businesses engage in trade. In the United States, exporters outperform nonexporters on employment, training, innovation, wages, and introducing new products. Yet less than 5 percent of US firms export. 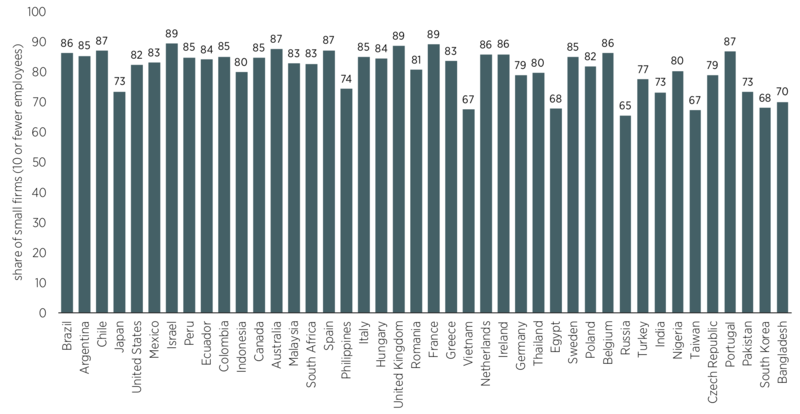 These patterns are similar to those in other OECD countries. Policies involving digital platforms and online social networks should not overlook their potential role in trade facilitation. An emerging body of evidence shows that businesses, particularly small businesses, on online digital platforms exhibit a higher propensity to engage in trade than businesses in general. Any policies and regulations on digital data flows should consider the trade-facilitating potential of these digital platforms. An emerging body of research, as discussed in this brief, shows that e-commerce can facilitate international trade, particularly for SMBs. 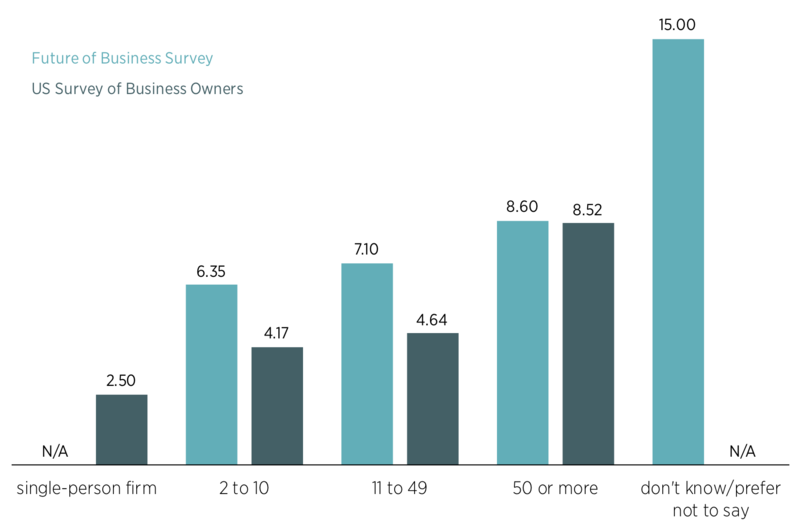 We analyze new data regarding businesses on Facebook from the Future of Business Survey. The survey is a collaborative effort of Facebook, the OECD, and the World Bank. The survey, launched in February 2016, has responses from 336,000 businesses on Facebook across 42 countries and includes information on business characteristics and whether businesses sell to foreign markets. Across all 42 countries, we examine the share of firms on the digital platform that engage in international trade. We would expect that having a Facebook page would enable a firm to strengthen its local relation- ships and expand its reach outside its local community. That is, a social networking platform can connect the firm not only with those in its own circle, but with those in its mutual friends’ circles as well. Facebook can facilitate trust across individuals and then use that trust mechanism by connecting a firm to expanding circles of friends. In this way, a social network can help to create bridges between individuals and other existing networks. For the United States, we analyze the relationship between the propensity to export and certain business characteristics, such as firm size and industry. 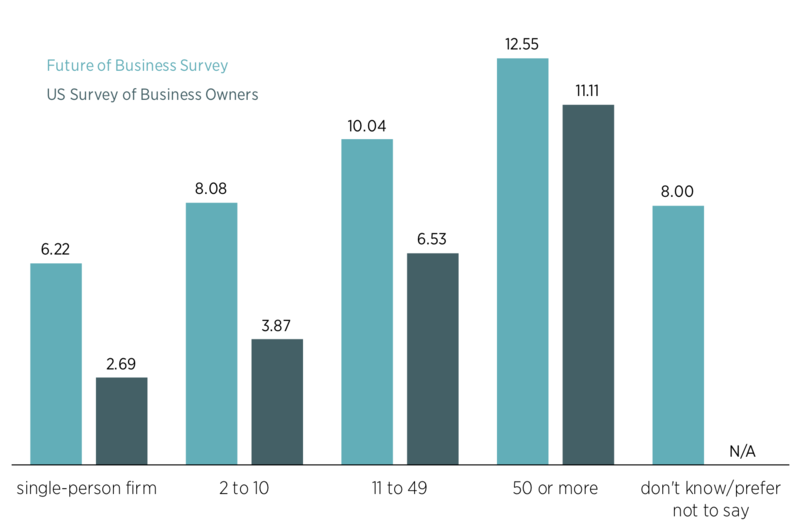 While the standard definition of an SMB is a firm with fewer than 500 employees, the highly disaggregated nature of the survey allows for a closer look at SMBs in terms of firm size (e.g., single person, 2–10, 11–49, and 50 or more). We find that US SMBs on Facebook nearly always export more than SMBs in general, regardless of firm size, industry, and the gender of the business owner. In the United States, SMBs represent 99 percent of all businesses, and 48 percent of employment, and they produce approximately 46 percent of private nonfarm GDP. 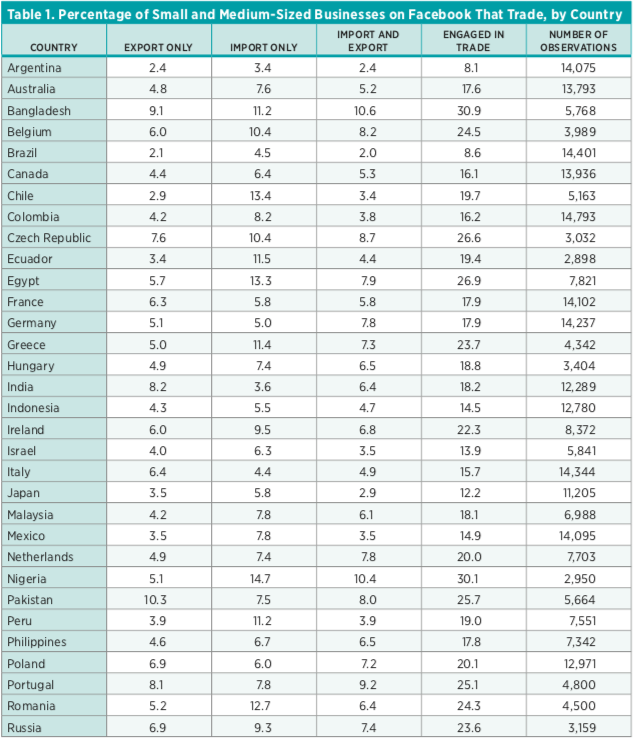 SMBs comprise the major- ity of firms worldwide. According to the World Bank, formal SMBs contribute up to 60 percent of total employment and 40 percent of national income in emerging economies. A body of cross-country evidence demonstrates that exporters typically outperform their counterparts that focus solely on the domestic market, in terms of total revenues, revenue growth, and labor productivity. The US International Trade Commission reports that US exporting SMBs have more than twice the total revenue, greater revenue growth, and 70 percent greater labor productivity compared to their nonexporting counterparts. While the data clearly demonstrate that exporters outperform nonexporters, that finding alone does not indicate a causal relationship (i.e., whether well-performing firms become exporters or exporting improves a firm’s performance). There seems to be empirical evidence for both possibilities. Andrew Bernard and J. Bradford Jensen provide compelling plant-level evidence that good firms become exporters: plant success is the best plant-level indicator of future exporting. The evidence for the other direction (that exporting improves firm performance) is not absent but is less clear. Once a firm begins to export, its productivity and wage growth are not necessarily superior, although these firms do exhibit higher employment growth and higher probability of survival over three to five years. Recent work by David Atkin, Amit Khandelwal, and Adam Osman presents evidence of “learning by exporting,” whereby exporting improves technical efficiency. The authors conduct a novel randomized experiment and attempt to identify a causal effect of exporting on firm performance using firm-level data of rug producers in Egypt. Exporters exhibited higher productivity and quality after controlling for confounding factors. One explanation is that exporting helps to connect producers with sophisticated foreign buyers, who in turn induce producers to improve performance. Yet the share of firms that export remains stubbornly low. For instance, fewer than 5 percent of US SMBs export. Studies have examined reasons behind the low propensity of SMBs to engage in trade and point to access to financing, information barriers, and challenges with cross-border issues, such as regulatory differences and trade barriers. Larger firms tend to have larger social networks and advertising budgets, and they maintain relevant in-house expertise on customs administration, foreign regulatory issues, and trade finance, all of which are determining factors in their propensity to trade. In principle, digital platforms and financial technologies should facilitate information and trust and hence reduce the economic distance between parties. Large-scale datasets on cross-border e-commerce are not publicly available; however, researchers are finding ways to access data to study digital platforms and trade. For instance, Andreas Lendle and coauthors find that 97 percent of US-based eBay sellers export. In another paper, Lendle and coauthors examine how the digital marketplace platform eBay can reduce trade costs, and they find the economic effect of distance to be 65 percent smaller on eBay. The authors also compare the effect of geographic distance on eBay and total international trade flows. Using bilateral trade data on 61 countries and a comparable basket of goods, they find eBay can facilitate a distance-reducing effect on cross-border transactions. PayPal Government Relations reports that 79 percent of US small businesses on PayPal sell to foreign markets. The PayPal merchants that engage in exporting experienced higher growth rates: small business exporters on PayPal grew 32.8 percent from 2015 to 2016 compared to 22.9 per- cent growth for small businesses in general. These findings tend to be similar for coastal and noncoastal firms. Eighty percent of coastal merchants and 78 percent of noncoastal merchants exported in both 2015 and 2016, and coastal exporters grew by 32.1 percent while noncoastal exporters grew by 33.6 percent. Additionally, PayPal merchants in rural areas were just as likely to export and exhibited growth rates similar to those of businesses in urban areas. In contrast, national statistics show that a higher proportion of urban firms export than rural firms and that more exporting firms are located in urban regions than rural. To our knowledge, we are the first to look at the propensity of businesses on Facebook to engage in international trade compared to their counterparts in the general population. Facebook is somewhat different from other digital platforms, such as eBay, because it also functions as an online social network. The structure of Facebook facilitates connections across potential customers and the networks of those customers. The potential marketing reach is not trivial—there are two billion Facebook users. No fees are required to start or maintain a Facebook Business Page, and while a business may choose to buy ads on Facebook, fewer than 10 percent actively advertise. The cost of economic distance has been well documented in international trade—information frictions were first highlighted by James Rauch and have been found to account for over 90 percent of the distance effect in international trade. Studies have shown the internet and online social connectedness can reduce the costs of economic distance through reduced search costs and easier business and customer networking. US firm participation in exporting has been found to be positively related to internet usage in the exporting country. William Lincoln and Andrew McCallum find that a 1 percent increase in internet users in a country increases the probability of US firms exporting there by about 1.1 percentage points, all else equal. Social connectedness can also facilitate trade. Recent work by Michael Bailey and coauthors introduces a new measure of social connectedness between US county pairs and between US counties and foreign countries. The researchers use the number of friendship links on Facebook to construct a “Social Connectedness Index” and examine the role of social networks in facilitating economic and social interactions. They find that the social networks on Facebook are relatively geographically concentrated. For the population of the average US county, 62.8 percent of friends live within 100 miles. Notwithstanding, Bailey and his coauthors still find that trade with foreign countries is strongly related to social connectedness. In addition, higher social connectedness is associated with greater cross-country migration and more patent citations. Search costs and network access are hurdles to international commerce for both importers and exporters. Mary Egan and Ashoka Mody have examined this from an importer’s point of view, and Bernard and Jensen from an exporter’s point of view. Local networking can facilitate international trade. Kamal and Sundaram examine the role of network effects in international trade and transaction costs. Their results indicate that a 10 percent increase in the number of exporters in a city results in a 5.1 percent increase in the likelihood of a first-time match between said sellers and buyer(s). In other words, the more exporters a firm is geographically close to, the more likely it is that the firm will network and receive information about buyers abroad; inversely, the fewer exporters a firm is around, the less likely it is that the firm will network and share buyer information. The Future of Business Survey is a collaboration between Facebook, the OECD, and the World Bank to identify how SMBs utilize Facebook Business Pages to promote and facilitate business operations. The survey project was first launched in February 2016 and included 28,000 businesses from 17 countries. As of April 2018, the survey represents over 336,000 businesses with a Facebook presence across 42 countries and 31 different languages. Randomly selected firms receive the survey from Facebook and can respond to the survey once per year. The survey includes 15 to 20 questions and takes on average 5 to 7 minutes to complete. Over time, the questions have changed slightly, as noted in the analysis later. The surveyed businesses encompass a broad range of sectors, including manufacturing; construction; wholesale and retail trade; automotive repair and maintenance services; transport, storage, and communications; and other sectors. 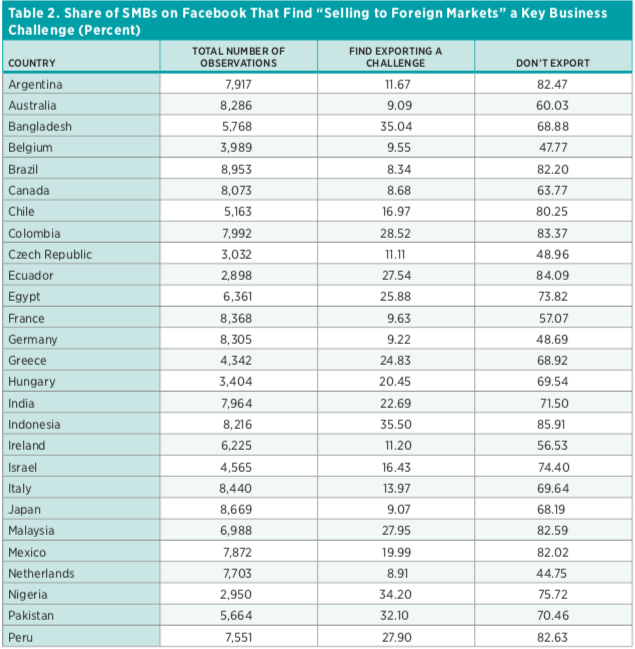 Table 1 reports the percentage of SMBs on Facebook that engage in international trade, by country, and the number of observations for each country. The share of firms engaged in trade varies across countries (e.g., 8.1 percent in Argentina, 17.6 percent in Australia, and 30.9 percent in Bangladesh). Figure 1a plots the share of businesses on Facebook that export, by country, in ascending order. Figure 1b shows the share of Facebook businesses with 10 or fewer employees. Small businesses represent a large share of firms not only in general, but also on Facebook (on average 81 percent). In the United States, the share of firms on Facebook that export is 7 percent, and the share of firms on Facebook with 10 or fewer employees is 82 percent. The top two key business challenges cited were “attracting customers” (75 percent of respondents) and “increasing revenues” (59 percent of respondents). Starting in October 2016, firms were also given the option to select “selling to foreign markets” as a major business challenge. 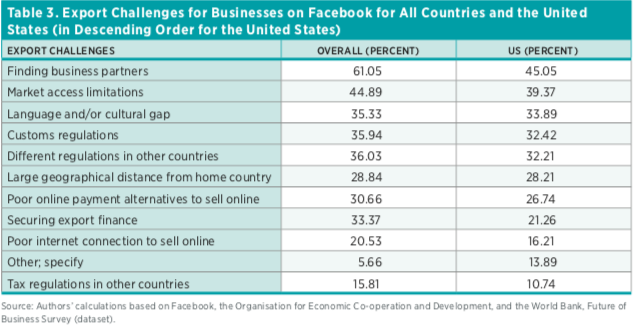 Overall, 18 percent of businesses on Facebook across all countries (48,675 of 271,205 firms) stated that “selling to foreign markets” was their most important business challenge, followed by “market access limitations.” “Language and/or cultural gap” was the third-most-cited challenge for US firms, and “customs regulations” was the third-most-cited challenge for businesses overall. 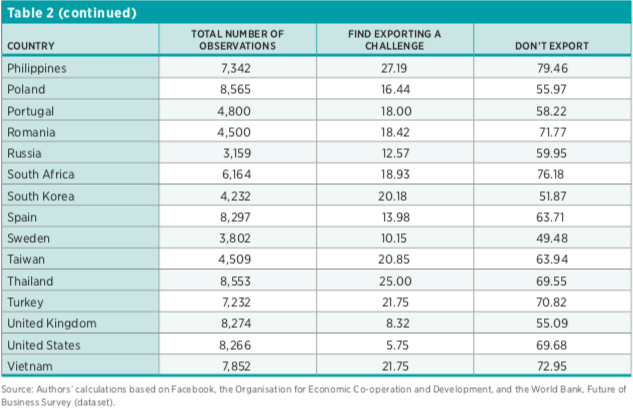 Table 2 reports the share of firms that finds exporting a key business challenge and the share of those firms that does not export. Of the 8,266 US firms that were asked this question, 475 firms (5.75 percent) indicated that selling to foreign markets was a major challenge, and of those firms, 69.68 percent do not export. The firms that indicated exporting was a major challenge were also asked to select the potential reason(s) as to why it was a challenge (see table 3). 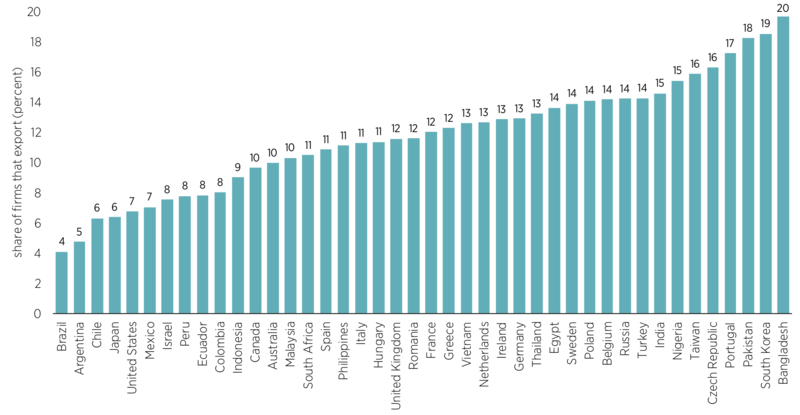 “Finding a business partner” was the top challenge for all countries overall and for the United States. The second-most-common challenge was “market access limitations.” For US firms on Facebook, the third- and fourth-most-cited challenges were “language and/or cultural gap” and “customs regulations,” respectively. 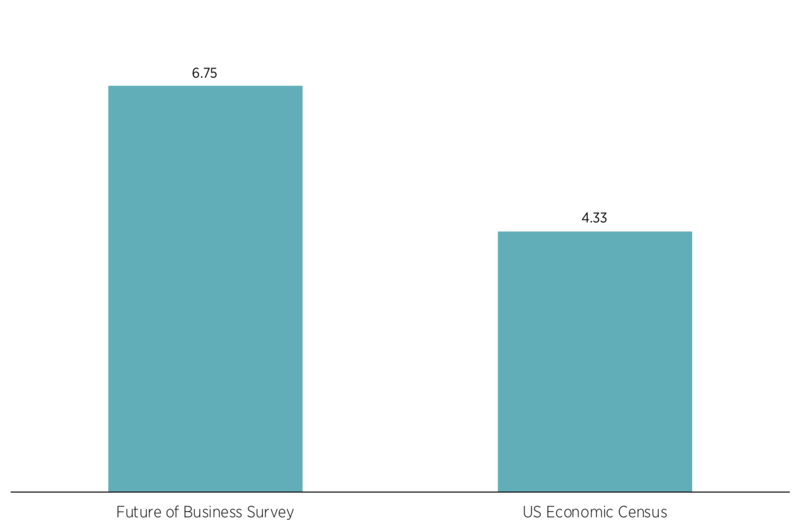 The 2012 Economic Census reports data on propensity to export by industry and firm size, and the 2012 Survey of Business Owners reports propensity to export by gender of owner. 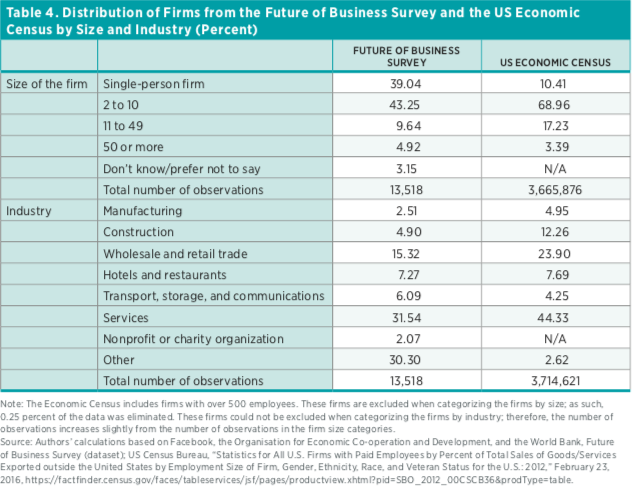 Table 4 shows the distribution of firms using data from the Future of Business Survey and the Economic Census. The proportion of single-person firms on Facebook is greater than the proportion of single-person firms in the general population (39.04 percent compared to 10.41 percent, respectively). The share of firms with 50 to 500 employees is 3.39 percent in the Future of Business Survey and 4.92 percent in the Economic Census; additionally, firms with fewer than 49 employees are the vast majority of firms in both surveys. 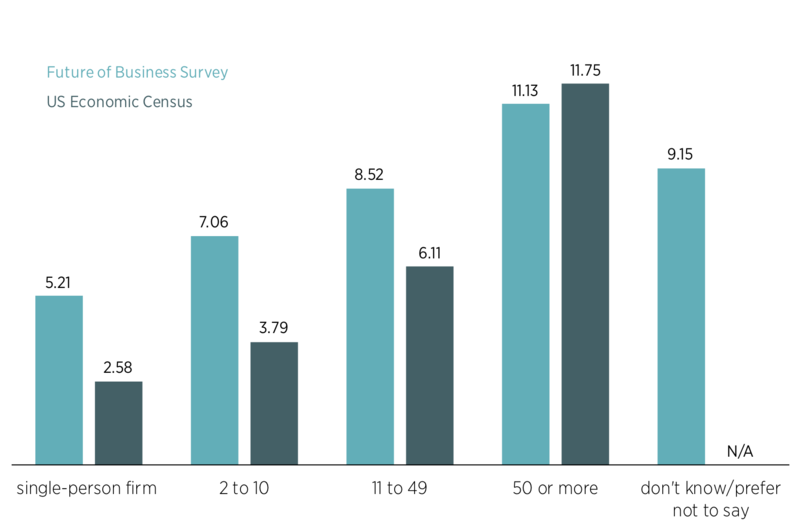 Refer to appendix A for changes in Future of Business Survey firm size categories and the full overlap of firm size categories for the two surveys. With regard to industry categories, there was approximately double the share of manufacturing and construction firms among firms in general as firms on Facebook. The other industries had more equal distributions between firms on Facebook and firms in general, with the service industry the largest in each, representing 31.54 percent (4,264) of the SMBs on Facebook and 44.33 percent (1,646,811) of all firms in the Census. The “other” category represented 30.30 percent of Facebook firms and 2.62 percent of the general population, which includes arts and entertainment, mining, electricity, and agriculture (see appendix A). A direct comparison allows us to examine four firm sizes: single person, 2 to 10, 11 to 49, and 50 or more. Standard analysis of SMBs groups all firms with fewer than 500 employees, but these data allow for greater disaggregation, which is important because the vast majority of firms have fewer than 50 employees—92 percent of Facebook firms and 97 percent of firms in the Census data. In the Future of Business Survey, firms were also asked about the gender of those in top management (a firm is considered male owned if more than 60 percent of top management positions are held by men, and vice versa). Firms are considered equally owned firms if 40 to 60 percent of top management positions are held by either gender. 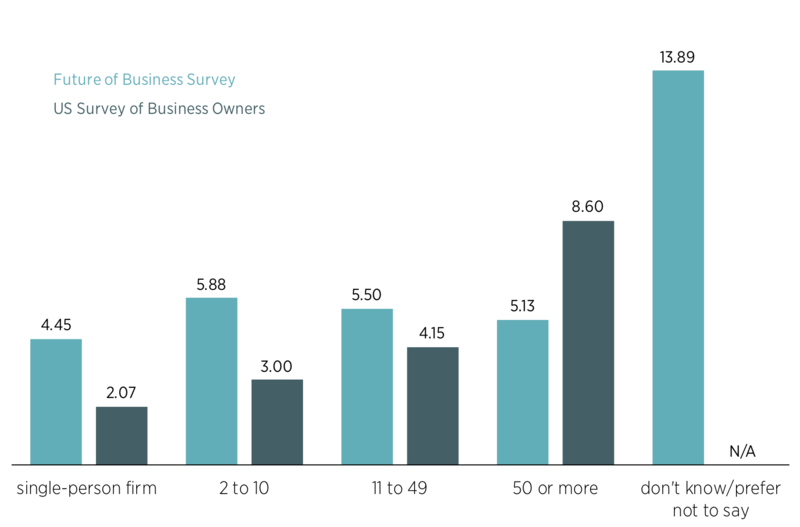 These data are compared to the findings from the 2012 Survey of Business Owners. 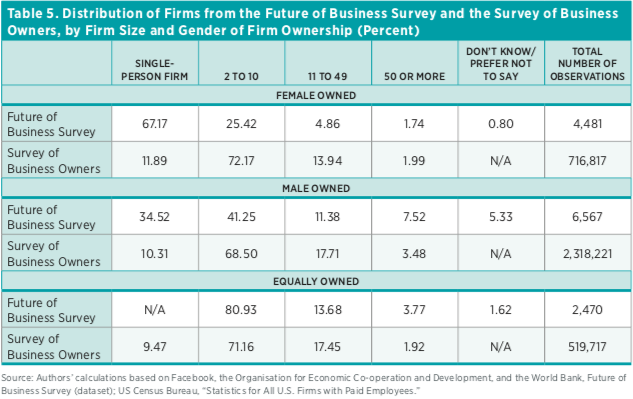 The share of single-person firms is higher on Facebook for both female- and male-owned firms than for firms in the general population (see table 5). Two-thirds of female-owned firms on Face- book are single-person firms, compared to 11.89 percent among firms in general. One-third of male-owned firms on Facebook are single-person firms, compared to 10.31 percent among firms in general. Overall, 6.75 percent of all US SMBs on Facebook export, compared to 4.33 percent of US SMBs in general (figure 2). By firm size, the propensity to export is higher for firms on Facebook than for firms in the general population among every firm size category except larger firms, among which the propensities to export are similar (11.13 and 11.75 percent, respectively) (see figure 3). Single-person firms on Facebook are more likely to export than are firms in general—approximately 5.21 percent, compared to 2.58 percent. Similarly, on Facebook, 7.06 percent of firms with 2 to 10 employees export and 8.52 percent of firms with 11 to 49 employees export, compared to 3.79 percent and 6.11 percent of firms in general, respectively. 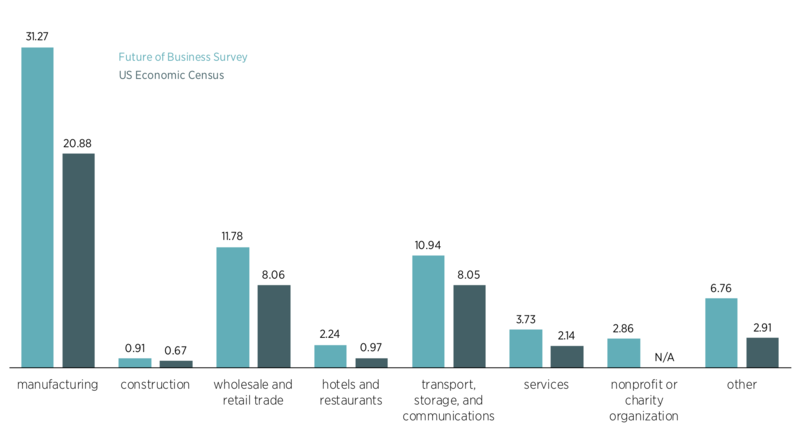 Figure 4 shows that the share of exporting firms is greater on Facebook than in the general population for every industry category. Manufacturing firms are the most likely to export both in general (20.88 percent) and on Facebook (31.27 percent). For wholesale and retail, 11.78 percent of firms on Facebook export, compared to 8.06 percent for firms in general. For the services category, which was the largest industry category for firms on Facebook as well as firms in general, 3.73 percent of firms on Facebook export and 2.14 percent of firms in general export. Figure 4 Figure 4Figures 5, 6, and 7 show the propensity to export across each gender ownership category. For both female- and male-owned firms, the share of firms on Facebook that export is higher than among firms in general for the three firm size categories under 50 employees (single person, 2 to 10, and 11 to 49 employees). The propensity to export for male-owned SBMs is higher on Facebook for each firm size category. Lastly, for equally owned firms (firms with equal male and female ownership), businesses on Facebook exhibited a higher propensity to export than the national average in every firm size category. Using new survey data of SMBs on Facebook, we present detailed statistics for the United States and examine the propensity of firms on Facebook to export compared with firms in the general population. We found that US firms on Facebook have a higher propensity to export than firms in general for every firm size category (except the largest), every industry category, and for both female-owned and male-owned firms. While the Future of Business Survey includes many countries, it is limited to countries that maintain the necessary national statistics. In a recent piece, we found similar patterns for Australia: the propensity to export is higher for Australian businesses on Facebook than for businesses in general for every firm size category (except the largest) and for every industry category. Our findings are consistent with the emerging body of literature on digital platforms and international trade, which generally shows that businesses, particularly small businesses, on online digital platforms exhibit a higher propensity to engage in trade than businesses in general. Whether export-prone firms are more likely to be on digital platforms or the other way around, any policies and regulations on digital data flows should consider the trade-facilitating potential of these digital platforms.